Enchanting flowers and swirls for a whimsical garden. Perfect embellishments for numerous design projects. Not all are shown. The actual images have no drop shadow. 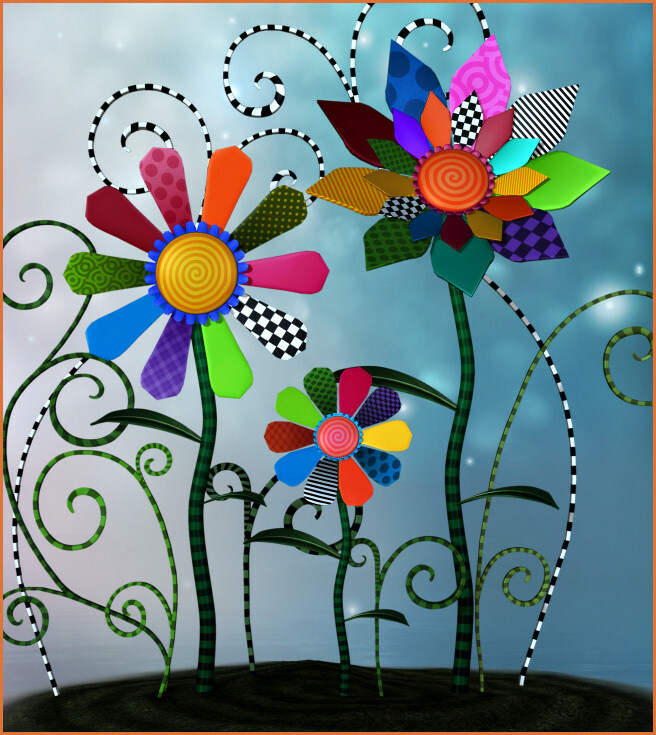 Build a whimsical flower garden this spring. 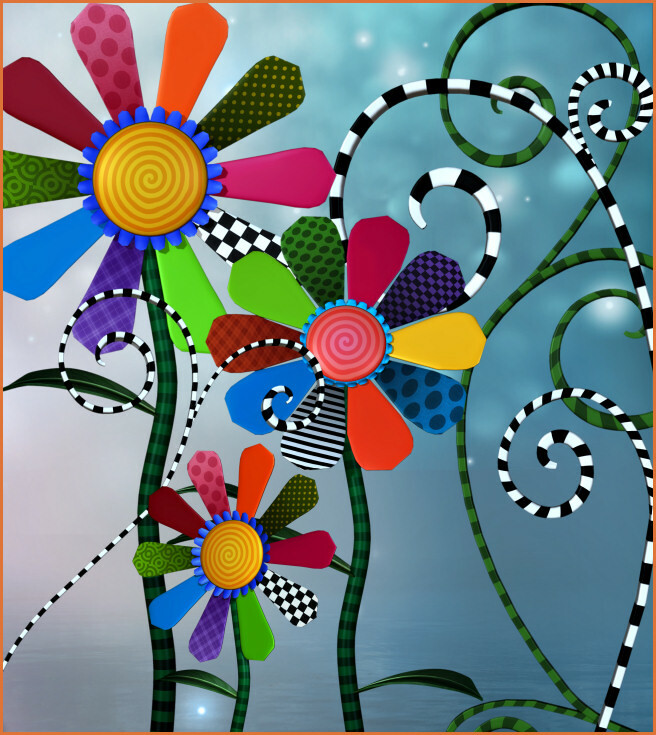 Create a stunning garden of pure enchantment with these Whimsical Flower Garden Graphics. Included are some pre-arranged flower groupings and many separate flowers and dreamy vine-like swirls. The elements would be perfect embellishments for all types of designs, including card making, scrapbooks, and other creative projects. Swirls add an interesting facet to any design they grace, and there are several in this package. The landscape background that I used in the promo images and the seamless tile that I used on this page are also included. The background is 1327 X 1652 pixels. 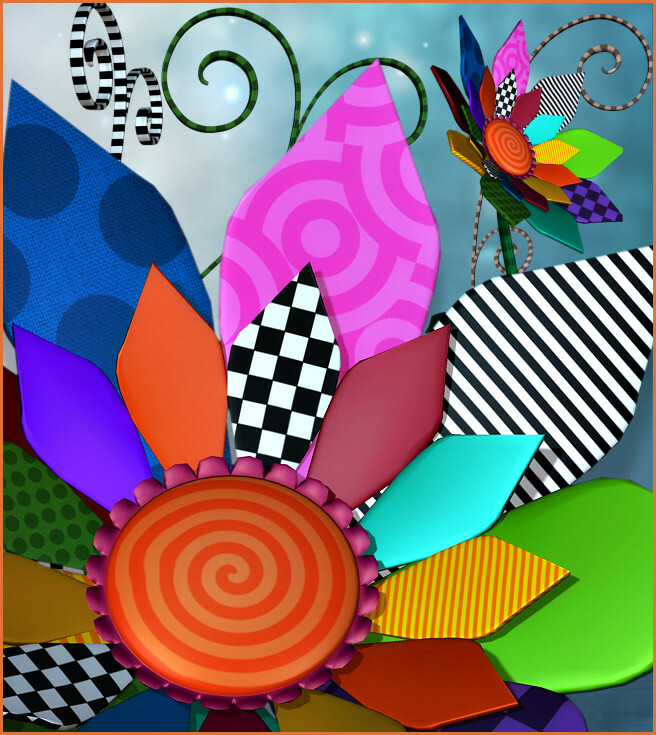 There are 35 royalty free, high-quality clipart PNG images in this package. All of these images (except the background) have transparent backgrounds making it easy for you to use them as tubes or nozzles–or merely to drop into your design. The size of these images varies, but they are approximately 1200 X 2100+ pixels. All are 300 DPI, making them great for print projects. Perfect for web design, template design, graphic design, t-shirt design, candy wrappers, scrapbook design, print transfers, DIY crafts, card making, embroidery designs, fabric blocks, address labels, business cards, newsletters, stationery, invitations, banners, crafts you print, paper projects, digital stamps, notelets, stickers, notecards, signature tags, and more. Please read my terms to learn more. This package is one zip file, which is about 40 MB. Download all of the graphics on this site. I've decided to start adding single tubes and smaller packages to the site! This way, I can add more diversity to the site. So watch for the new content!